1. It turned out SO cute! 2. It was SUPER easy! 3. It took me 1.5 hours! 4. It cost me a grand total of $6.00! It looks like BOTH of us got an adjustment. Sometimes night-time is the best time to work on my projects. 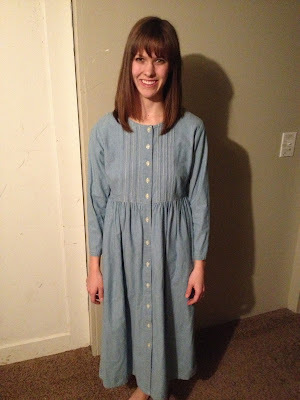 One 90s Mom dress that your first grade teacher wore (odds are very likely you'll find one of these at your local thrift store). The size doesn't matter too much. Mine was a size Small Petite (I am not petite). 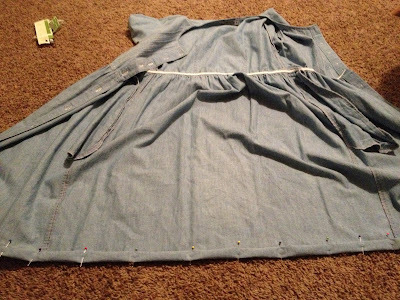 Try the dress on and use pins to mark the spots where you want the length to be. 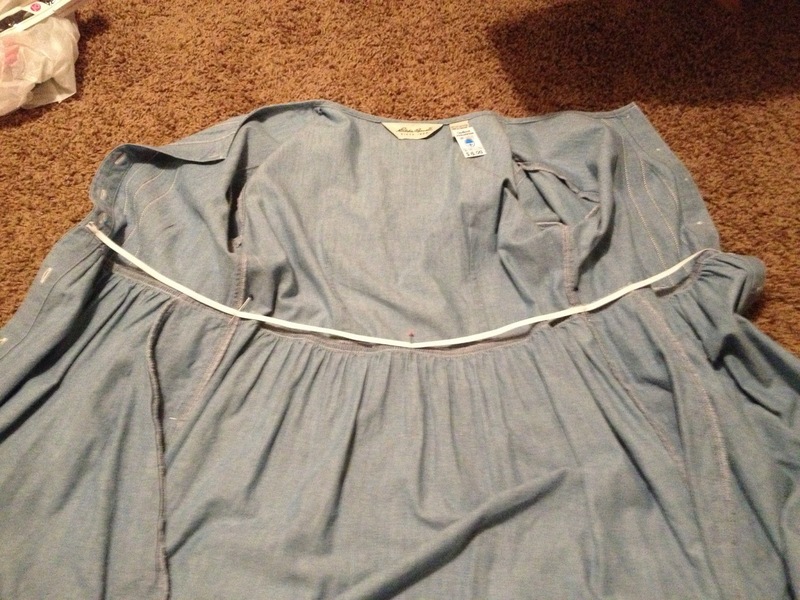 The sleeves (if the dress is long sleeved) and the length. Step 2: Take the dress off and add 1.5 inches to the length of those spots for seam allowance, then cut. To make sure the sleeves were cut at the correct angle, I just folded it up on itself and lined up the original sleeve "cuff." 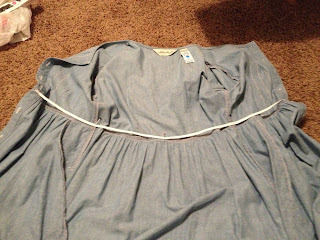 Note: If the sleeves are a little too big for your taste, try the dress on again, decide on how big the arm hole needs to be, turn the dress inside-out, and straight stitch 1/4 inch past the place where the sleeve is sewn onto the dress. 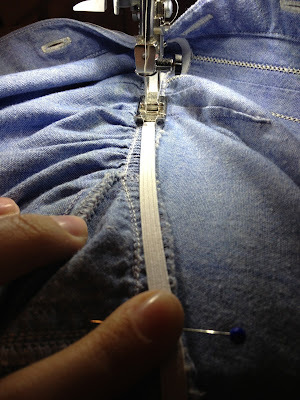 Leaving your needle in the material, lift your sewing foot, turn your dress, drop your sewing foot, then gradually stitch down back towards the original side seam in your dress before you reach the point where you want your elastic (DO NOT sew down the entire dress). Zig-zag stitch along the outside of your straight stitch and cut the excess (this prevents any fraying). 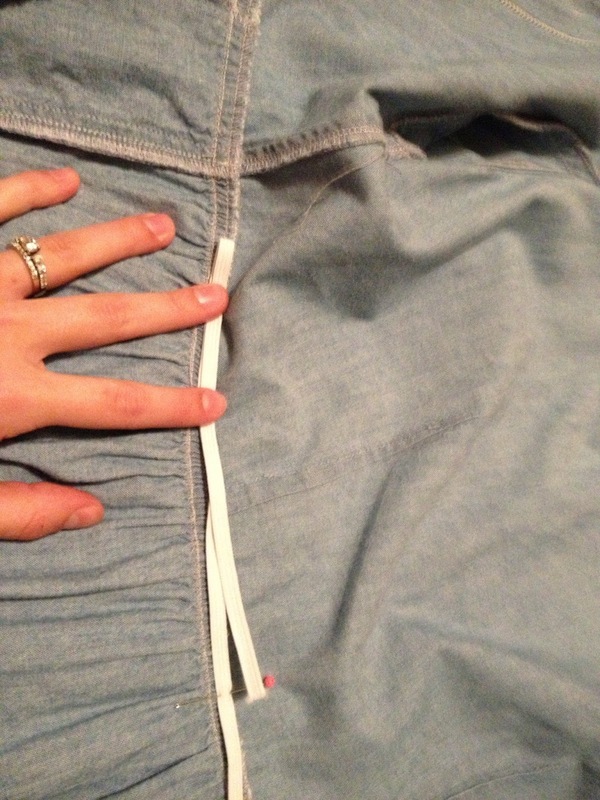 Step 3: Measure around your waist where you want the elastic to go (not too tight) and cut your elastic to that length. Like I said, mine was 30". Step 4: Pin the center of your elastic to the center of the back of your dress. Find the middle between the end of your elastic and the center of your elastic and pin that to the side seam of your dress on both sides. 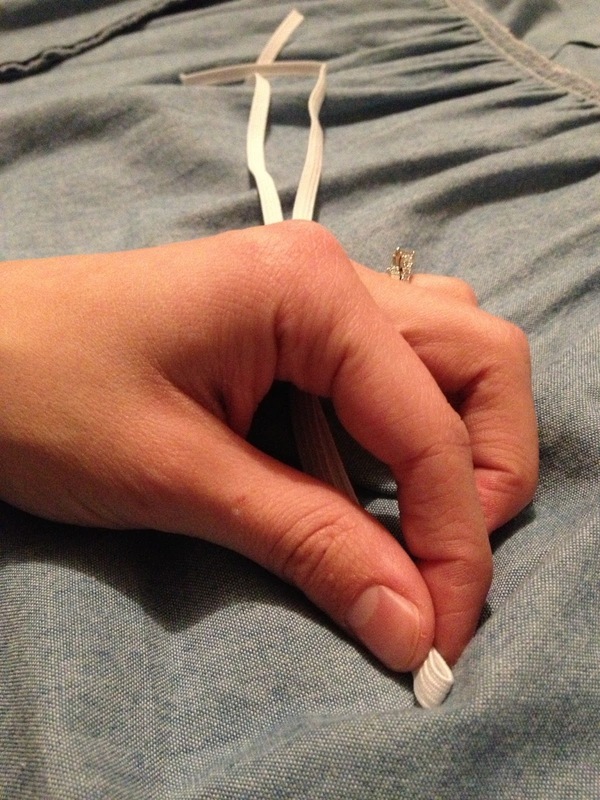 And finally pin the end of your elastic to the edge of the dress. Make sure you do this on both ends. 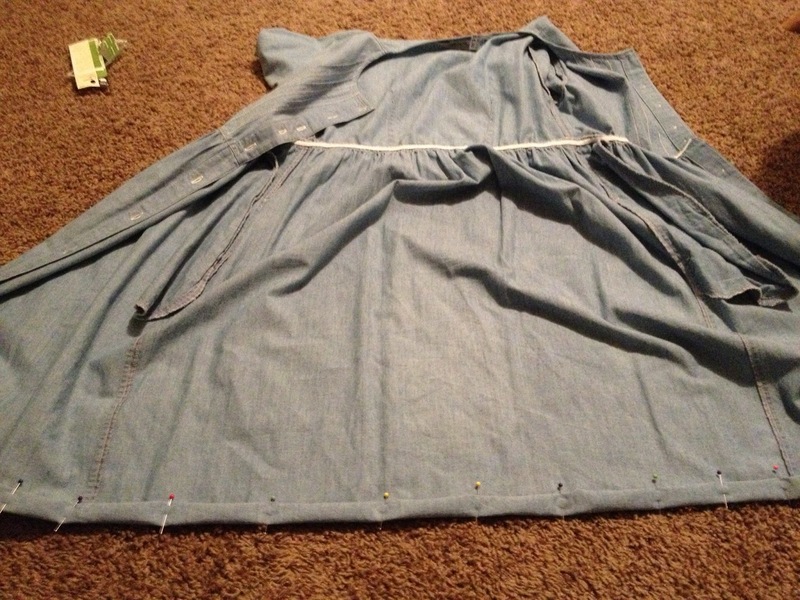 stitch on top of the elastic, stretching it to lie flat on your dress as you sew. 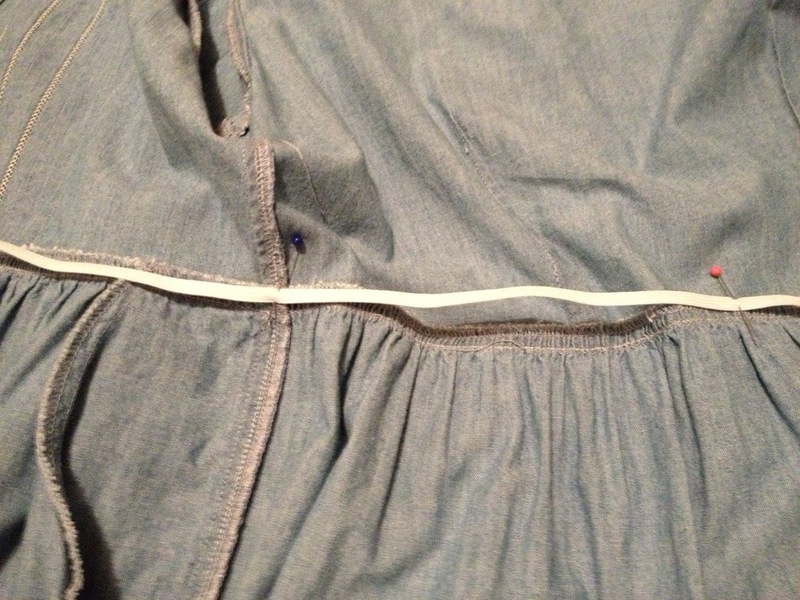 Note: I didn't mind the zig-zag stitch showing on the outside of the dress because I knew I would wear a belt, but if it bothers you, I'm sure you could stitch a binding to cover it. 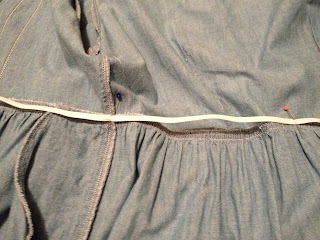 Step 6: Set your sewing machine back to a regular straight stitch and hem the bottom of your dress at 3/4" (fold it over once 3/4", then fold it over again 3/4"). Be sure to straight stitch along the very edge of the dress at about 1/8" to give it a finished look. 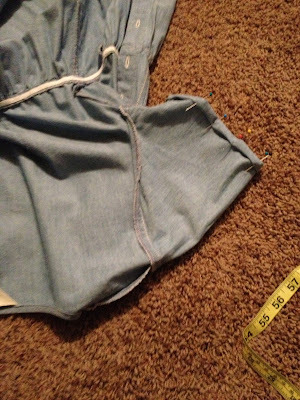 Repeat these steps for the sleeves if you've cut them off. And that is it! Seriously, so easy and I love that it only cost me $6.00. 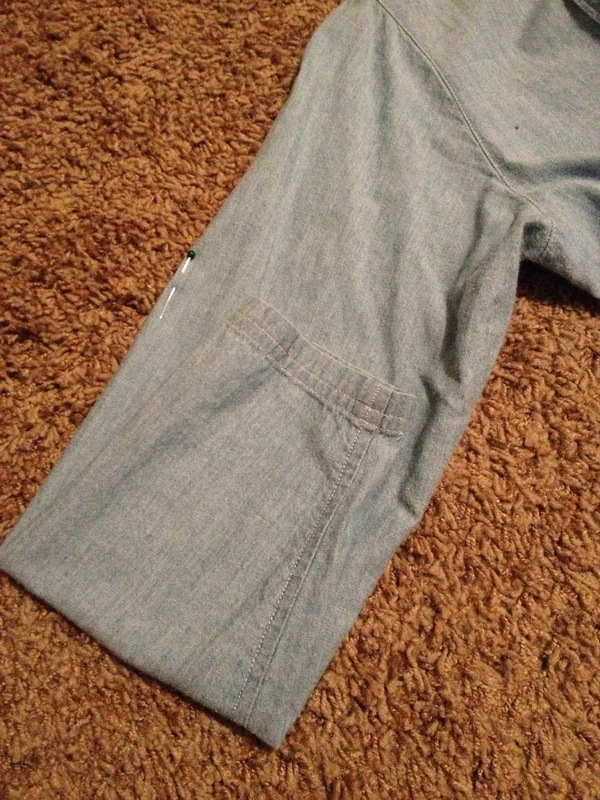 Works as everyday clothing, or even for the beach! I can not WAIT for the summer! Be sure to check out my Etsy shop! I've updated the Etsy page on my blog and I've posted a couple more listings that I think you'll really like, including the Changing mat I posted about a few days ago. Have a great weekend and I'll see you again on Monday! Did I mention that it has pockets? LOVE it! Thank you for always taking my pictures, Mariasha! And for letting me borrow your shoes! I know, right?! It just makes any outfit better, especially dresses. I'm not a huge fan of the phone in the bra, you know what I mean? Thanks for following, Meg, and welcome to the blog! This turned out so cute. 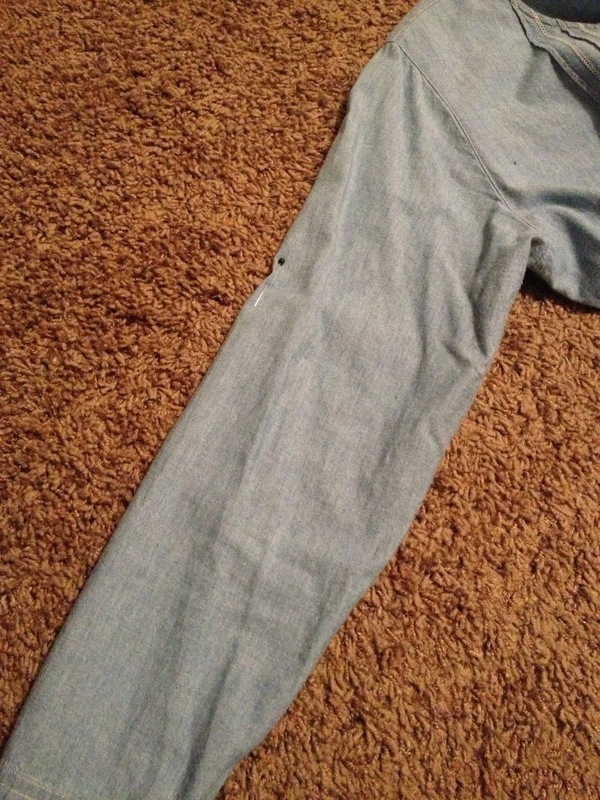 And I agree I love the pockets! It makes me want to go and make some of my old clothes that are hanging around cute again. This is super cute! You have done an amazing job. You're definitely going to get a whole tonne of people asking where you got it! Thank you ladies! Chloe, it took me a while to get to your blog, but now I have and I love it! So glad to be your newest follower!